Yesterday I had a visit from the people who've bought my apartment. Such a relief! First, because I liked them so much. They're a young couple with a baby, and seemed very warm and generous. Since this has been my family's home for the last 25 years, I'm very happy to have it lived in by another family, rather than purchased by an investor who doesn't see it as 'home'. I'm also happy there'll be another young family in the apartment block to provide generational change and continuity. Second, the purchasers are planning some renovations - mainly to the kitchen which probably needs some updating after 25 years - and won't be able to move in immediately. So they're happy for me to stay put for another week (until 10 August) before moving out to my newly renovated apartment. This is an immense relief - partly because my Bendigo-caught cold has significantly delayed my packing (or maybe it's really just my talent for procrastination) - but mainly because I'm doubtful the renovation would have been at a stage by 3 August to enable me to move even my possessions. This is an indication of where things were up to at the weekend. All the cabinets and cupboards being fitted into the limited space. Lots done, but lots still to be completed. 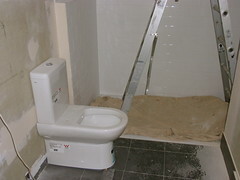 So, we have a bit of an extension for more of the work - though, as Heather says, 'don't tell the tradespeople!" PS... Yesterday I also got to meet quite a few family members of the people who bought the apartment, including the fairly well-known Australian rock singer who's the father of the woman who bought the apartment. I hope I was very cool! While coughing and sniffling and spluttering my way through the day - with the same cold I had more than a week ago in Bendigo - I've been sorting and packing my books, trying to decide which ones to keep and which ones I can do without. I came to my shelf of cookbooks. There were two books where the decision was very easy. There's just no way I could do without them. Elizabeth David's Italian Food and Julia Child's Mastering the Art of French Cooking. They're both old Penguin publications whose covers have come adrift and whose pages long ago lost contact with the books' spines. They're stained by food and age and I have to regularly reorder the pages of Italian Food. I'm not sure exactly when I acquired Italian Food. I think around 1970, though I'd had Mediterranean Cooking some years earlier. 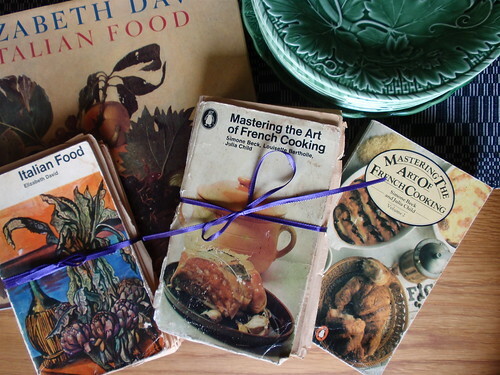 As she did for many women my age, Elizabeth David opened new worlds of food for me. I still love and use her recipes. They're very non-prescriptive; but somehow they convey the spirit of the recipe so well that they work. She writes like an angel, and even if you had no desire to use her recipes you could read her books to capture the spirit of place even better than most travel writing. I have a book of her food writing and essays, An Omelette and a Glass of Wine, that gives me so much pleasure I reread it from time to time. I also have a beautifully illustrated 1990s edition of Italian Food, but I don't think I could ever use it to cook from. I'd be lost without hunting thorough the tattered pages of my Penguin edition and cursing the missing page from the index of recipes. I discovered Julia Child a little later - maybe in the mid 1970s. Her cook books are at the other end of prescriptiveness from Elizabeth David's. Every step and sequence is minutely described - for example, she has a very simple recipe for poached chicken with vegetables that I use frequently that, despite its simplicity, runs over four pages. Her book is truly the ultimate cook book for beginners, or for those days when you want assurance that your recipe is going to work. I hope I'm not as easily distracted from my packing again or it will never get finished. 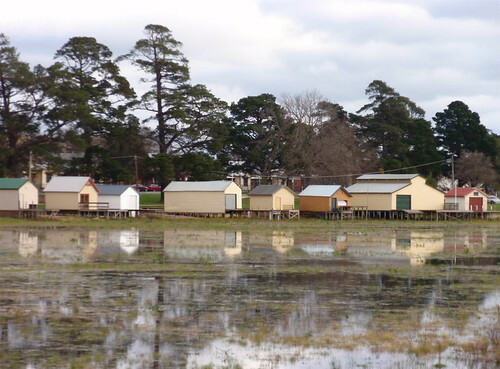 Why has it taken me so long to discover just how beautiful rural Victoria is? 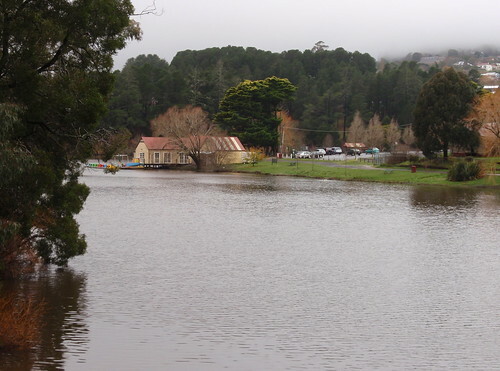 I've visited Melbourne many times and enjoy it greatly, but apart from last year's road trip that followed the Victorian side of the Murray River for a few days, I'd not visited rural Victoria since I was a child. Earlier this month my friend Jan and I spent a meandering week or so in central Victoria - leading up to the Australian Sheep and Wool Show in Bendigo. 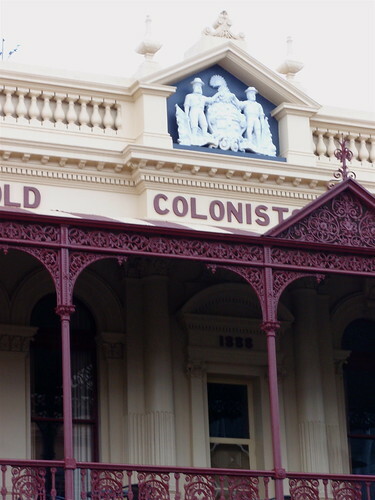 I've spent some time trying to work out what it is that makes Victoria so different from country New South Wales, so this is the first of my very amateur speculations on these differences. Victoria is of course smaller than New South Wales and the distances between towns - while still considerable - are less than in NSW. In addition, the farm lands (at least in the parts we visited on this trip) are richer and more bountiful so that the landscape is more intensively shaped by human habitation. 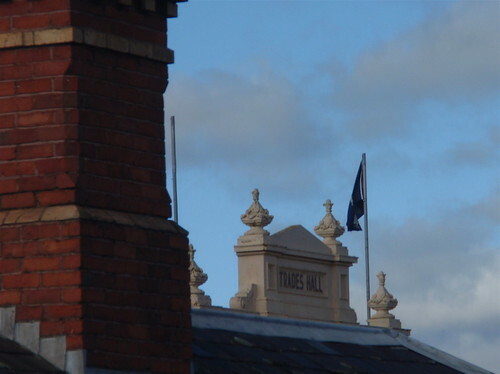 I particularly love the soaring ambition of public structures such as the Clunes Town Hall, a very grand structure in what is now tiny village. 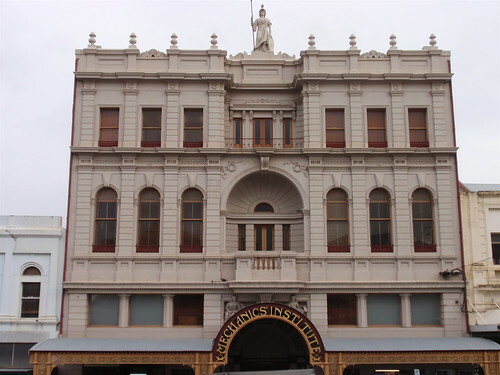 Even more notable than the public developments were the organisations, and their embodiment in buildings, that were voluntary associations of people coming together for more or less good causes - the libraries (often called athenaeums), mechanics' institutes, clubs whose aims included or excluded certain categories of people, galleries and theatres, and later in the nineteenth century, trades unions. 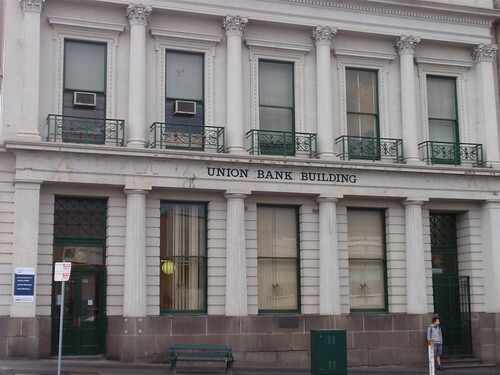 And then, of course, there are the grand memorials to trade and to industry - shops, banks, and stores. These buildings have such confidence in a grand future. We often forget that the nineteenth century was a time of great enterprise and innovation...and of great risk-taking in a new land. 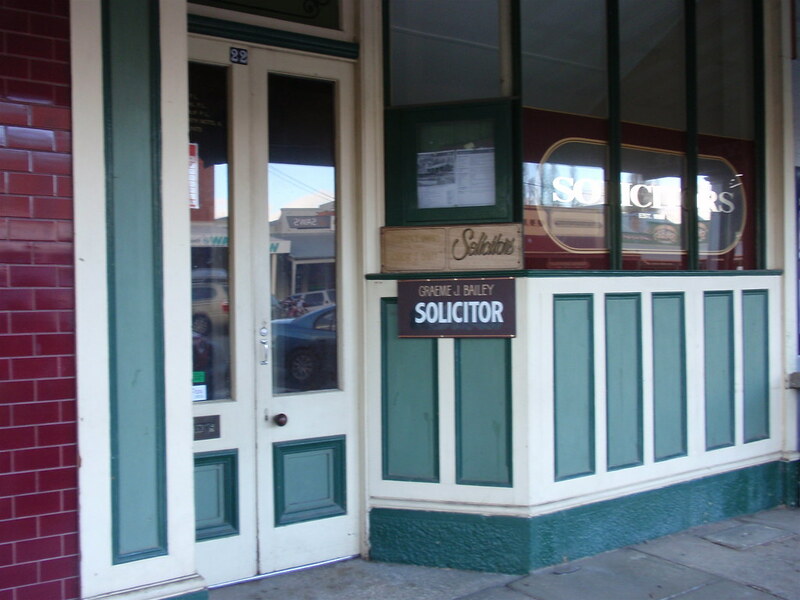 Shop-front from the 1880s, Beechworth. 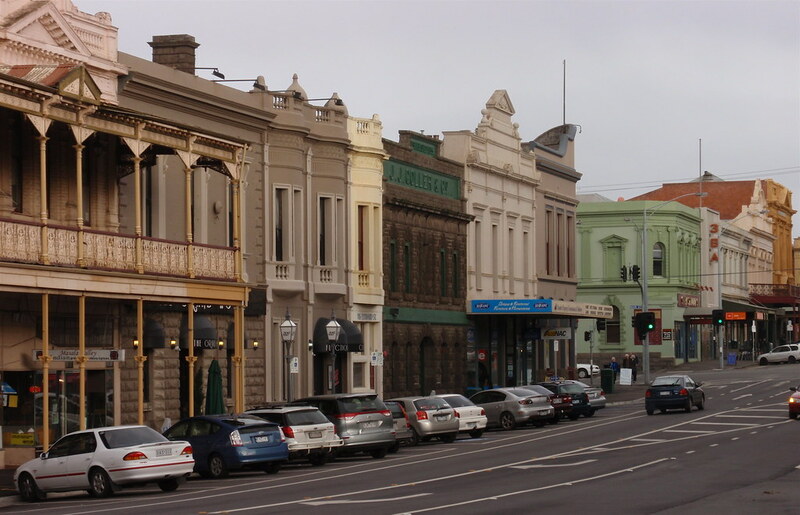 Through good luck or good management, many of these Victorian towns and cities have mercifully escaped the modernisation impulse that swept through NSW towns in the 1960s and 70s, removing so much of their character and individuality. 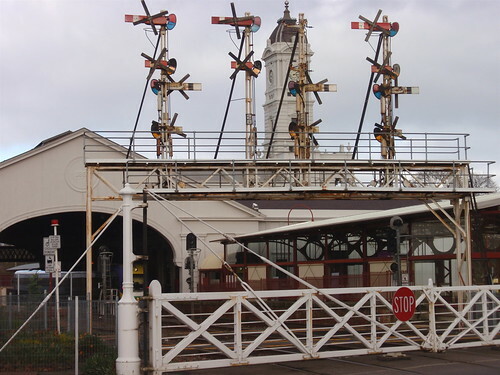 So many of these towns have been left with impressive architectural heritage that's now valued and preserved. But the other thing I found interesting was how deeply their intellectual and historic connections mesh with our national development. 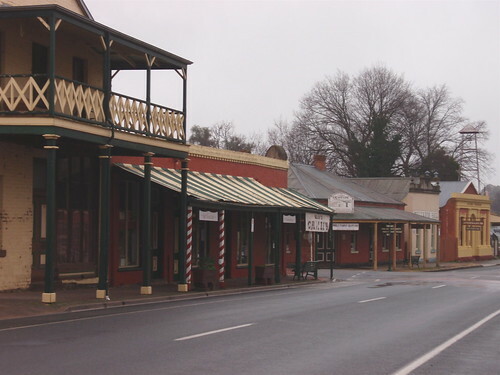 As an example, the little town of Chiltern, just south of the Victorian /NSW border, has amazingly rich associations. We stayed in Chiltern on the last night of our trip - mainly because it was a convenient stopping point on the long drive back to Sydney. We could profitably have spent a couple of days there. 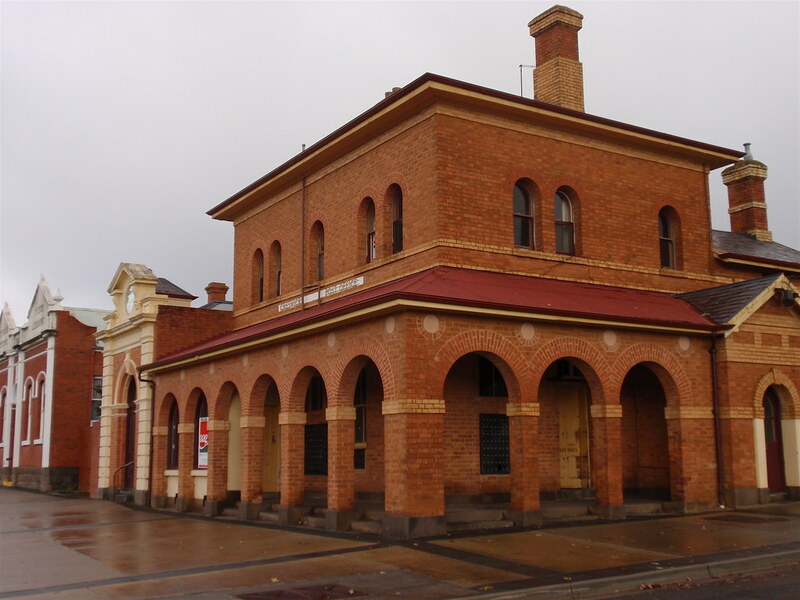 There are charming streetscapes, with glowing red brick buildings and wooden verandahs dating from the 1860s. But what astonished me were the connections of this tiny town to our heritage - Robert O'Hara Burke, the explorer of Burke and Wills fame, was stationed in Chiltern in the 1850's, just before his fateful expedition; Sir Isaac Isaacs, Australia's first Australian-born Governor General made his first political speech in the tiny Star Theatre in Chiltern; Ethel Richardson, later to become Henry Handel Richardon, author of a great novel - The Fortunes of Richard Mahoney - lived in Chiltern as a child in the 1870s and used her beautiful childhood house, now a National Trust property, as a setting for that novel. 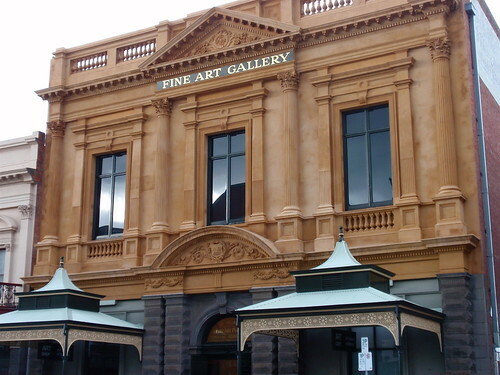 You can't visit such a town without reflecting on all the threads woven into modern Australia. The civic spirit I so admire also expressed itself through the creation of gardens and parks. 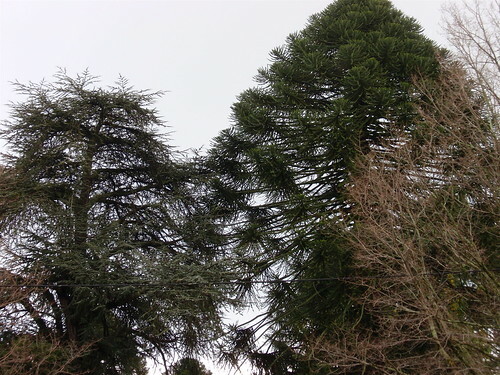 'Botanic' gardens with century old specimens of exotic trees are common. 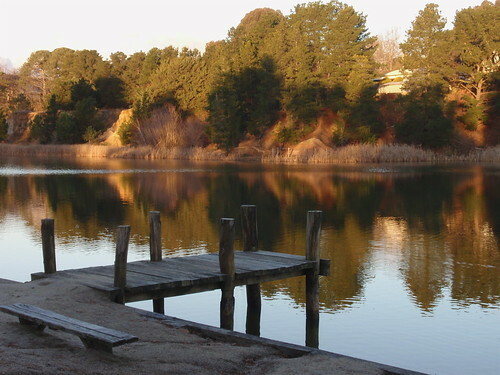 What I found even more interesting than the gardens were the projects to create lakes - often on land reclaimed from gold digging - as places for public use, and I imagine for respite from the dryness of summer. In mid-winter they were misty and peaceful and we often ate or drank coffee in the cafes and restaurants that fringe the lakes. 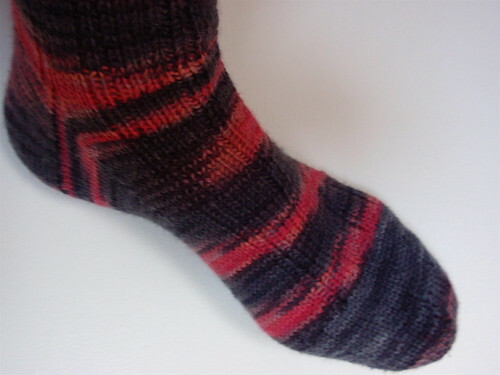 Much to my own astonishment, I managed to complete the second pair of my 2010 Personal Sock Club socks by their due date, 15 July. In fact, I actually finished them on 14 July, a day early. Even self-imposed deadlines seem to work for me (well, for knitting, at least). 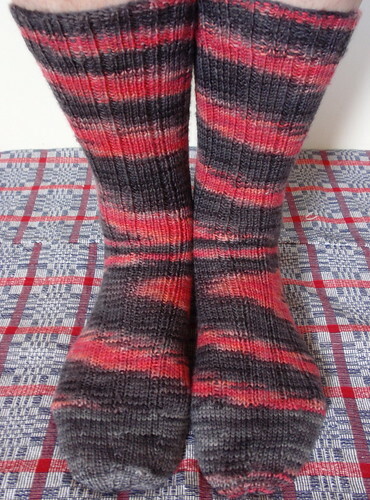 I'd been calling them Ember Socks because of the smoldering dull red and grey-black colour combination, but have decided they are more appropriately named Eccentric Socks. I like the way the colour changes make swirling spiral patterns, with some colour clumping around the ankles, and I like the inelegant gaudiness of them - what an earlier generation would have called their lairy quality. Knitabulous had creatively named this colour combination 'Count Sockular' and had supplied a small amount of variegated grey yarn with the red and grey main skein. I suspect I was meant to use the grey yarn for contrasting heels, but I used it for toes and ran out of the grey just before I finished the toe of the second sock. So, an added eccentricity is the tiny bit of red yarn on just one sock toe. Last night I remembered to lucky dip into my manilla envelopes containing the PSC sock yarns for the rest of the year and opened it to discover some Madelinetosh sock yarn in 'Scarlet'. More bright red socks! Wonderful. 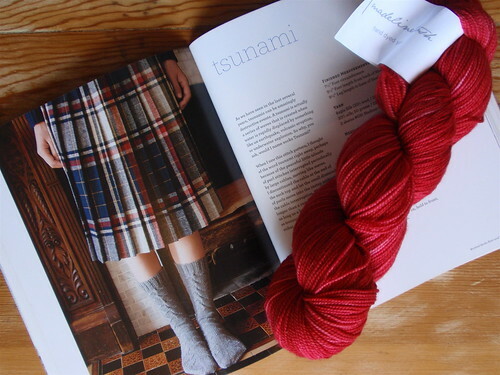 I think I'll make the Tsunami socks from Judy Sumner's Knitted Socks East and West. Due date? 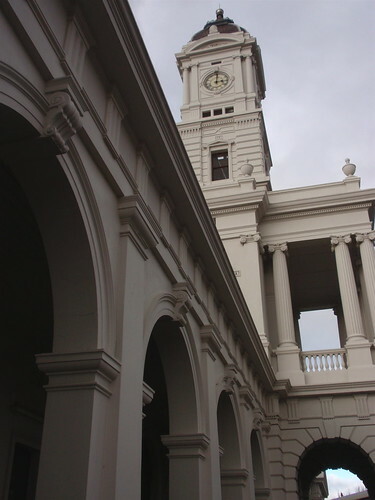 27 August (the date of my son-in-law's citizenship ceremony). Let's see how I go. I'm a fan of the British TV program Grand Designs, that follows people through the planning and construction of a grand plan for their dream house. Predictably, most of the projects end up well over budget and take much longer than anticipated to complete, with many tears and disappointments along the way. Despite all of this, most people say they are happy with the eventual outcome. I'm always interested to see how these houses are expressions of deeply held desires - for space, for freedom, for togetherness, for a new start. Most of the people featured are at an expansive stage in their life - when they're looking forward and aspiring to realise their dreams. My designs are much more modest. I no longer have the time or money or even energy for a grand design for my new apartment. And I'm not designing a house for new beginnings in my life, but rather for comfortable and enjoyable consolidation. I do want it to be convenient and suited to my tastes and aesthetic, but I don't see it as an ultimate expression of myself. I suspect 'modest designs' wouldn't have too much appeal as a television series. 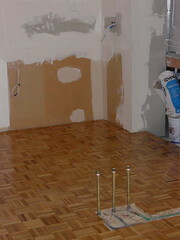 The floor for the living room, kitchen and hallway has been laid, sanded and has had its first coat of varnish. 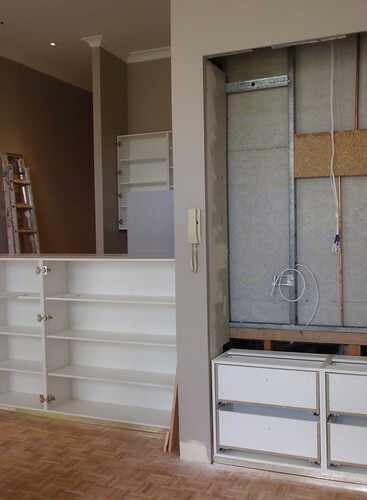 [The picture above shows the space where the kitchen will be]. 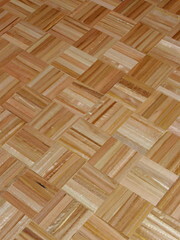 And yes, I've chosen very 1960s finger parquetry for the floor. In my desire not to have the apartment scream 'I was decorated in 2010' I think I've ended up with a bit of a retro feel. We now need to wait for the cabinets and cupboards of various kinds to be built and put in place before sinks, basins, taps, power points and lights can all be installed. Hopefully, this will all get under way next week. In the midst of all this I'm going away for ten days on a road trip around rural Victoria, ending up in Bendigo for the Australian Wool and Sheep Show. 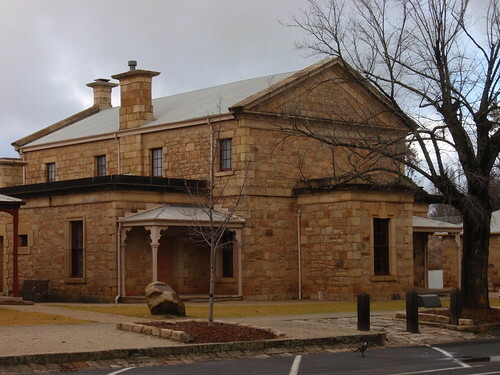 We're beginning in Beechworth, Ned Kelly country, and ending in Bendigo, but the bit in the middle we'll make up as we go along. I don't think I'll blog as we travel, but I'm sure there'll be travel reports after we return. Off to pack (and watch a bit of the Tour de France)! June and into July is always a busy period - particularly if, like me, you can be easily distracted by all the grand sporting events that are happening. Wimbledon tennis, cricket matches against Australia's arch-rivals, the English, the Tour de France (my favourite) and this year the football (aka soccer) World Cup. We're spoilt for choice. And, if you live in Australia, all these events take place in the middle of the night in winter. In work places there's much bleariness from continuous sleep deprivation at this time of the year. This year I also have renovations, sorting, culling and packing prior to moving in four and a bit weeks, and, as if all that wasn't enough, a brief holiday next week. 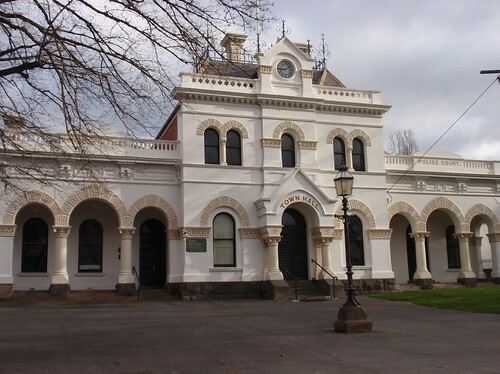 A friend and I are going on a plan-as-you-go road trip around central Victoria, culminating in the spectacle of the Bendigo Sheep and Wool Show. It all sounds a bit mad. The last couple of years I've used the Ravelry Tour de France Knit-a-long as a spur to completing a relatively large piece of knitting - a cardigan for myself in 2008 and one for my daughter in 2009. But this year I've been sensible enough not to put such pressure on myself when I've so much else to think about and do. So, I'm 'doing' Le Tour, but I'm making a very uncomplicated and comforting project - Cheryl Oberle's Wool Peddler's Shawl from her book Folk Shawls, with the much-admired Mustaa Villaa variation of a wide ruffle rather than lace edging. It's all garter-stitch - how soothing. I'm trying not to accumulate too much stuff just now as I'm panic-stricken about having enough space for things in my new, much smaller apartment, so I wanted to use yarn I already have. Now I'm hoping all those assertions I've heard over time about Grignasco 'Tango' being essentially the same as Rowan 'Felted Tweed' are accurate, as I plan to use a mixture of the two for my Tour de France KAL project. 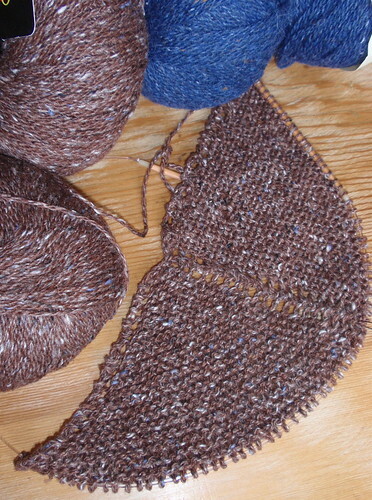 The body of the shawl will be brown, and the ruffle a deep blue that's not nearly as bright as this photo. Both yarns have small flecks of the other colour, so the combination goes well. I love these large, peasant style shawls - particularly when they're in garter stitch - so I'm looking forward with pleasure to knitting my way around Victoria while the cyclists are making their way around France.